The appearance of the ceiling in your home is just as important as the appearance of the walls, flooring, and furnishings. We specializing in Popcorn Ceiling Removal, Popcorn Ceiling Repair, Drywall Repair, and Texture Ceilings and Walls. The texture and color of the ceiling can greatly change the look of a room. There are various textures, color options, and methods of application that can make a ceiling unique as well as attractive. Textures are often used to hide imperfections in the drywall as well as rough seams. They are also used to add interest and beauty to otherwise plain drywall by creating a three-dimensional look. Since ceilings are bare, light coming from certain angles tends to accentuate bumps and seams that have been mudded and taped. Adding texture can dramatically change the look of a room. In the Plant City area, your Plant City Ceiling Contractor can masterfully install whatever type of texture ceiling that you want. We're licensed, bonded, and insured. Look at our procedures page to see the process for popcorn removal. Also see information about Popcorn Ceiling Repair. 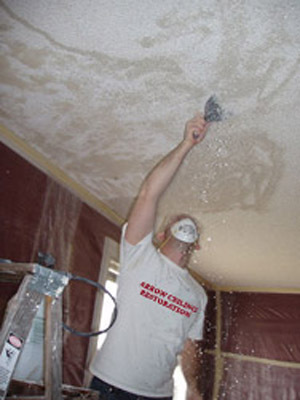 If you're looking for a Plant City Florida Ceiling Contractor Specializing in Popcorn Ceiling Removal, Popcorn Ceiling Repair, Drywall Repair, and Texture Ceilings and Walls, contact Arrow Ceiling Restoration today at (813) 840-3717, or complete our estimate request form.